information about the genesis of Butchertown Reserve. Butchertown Reserve is named after the neighborhood that Copper & Kings calls home, on the eastern edge of downtown Louisville: Butchertown. Located not too far from the Mellwood Distillery, Copper & Kings saved a dilapidated building and has been a key part in the revitalization of Butchertown. Copper & Kings sourced older stocks of brandy several years ago, mostly from the West Coast, and while continuing to age that brandy, Copper & Kings has installed three Vendome copper pot stills, and has been busy distilling brandy (grape and apple) and absinthe. 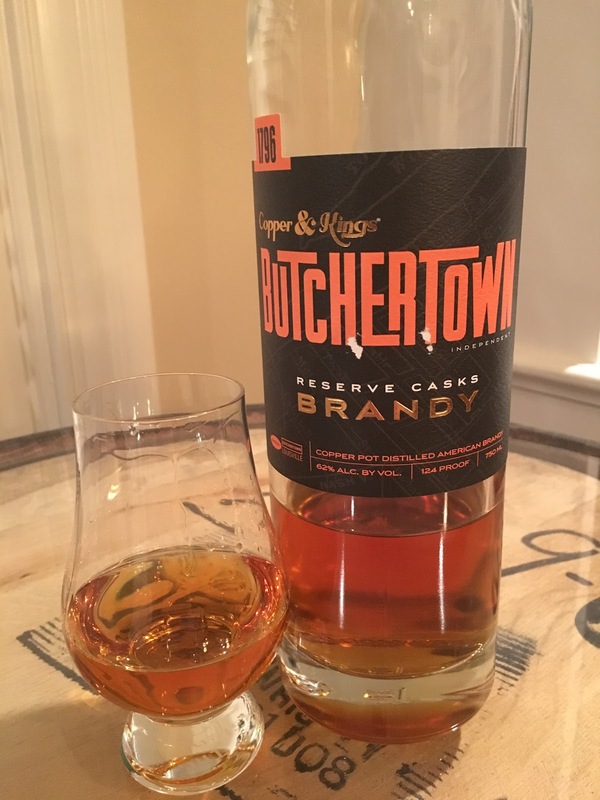 Butchertown Reserve originated with former Copper & Kings distiller Alan Bishop (now Master Distiller/Blender at Spirits of French Lick Distillery). In the course of creating a special offering for a single tasting event and auction, Bishop chose three used Heaven Hill barrels and one Kelvin Cooperage new barrel (#2 char) aging older stocks of sourced brandy, to provide a unique barrel-influenced Brandy. The blend was non-chill filtered, contained no coloring or flavoring additives, and was barreled at 125 proof. It turned out so well, though, that Copper & Kings launched it as a regular part of its lineup. Older Brandy stocks are still used in Butchertown Reserve and it is still blended pursuant to Bishop’s innovative combination of four barrels (three once-used Bourbon barrels and one new charred American Oak barrel from Kelvin Cooperage). It is also still non-chill filtered, contains no coloring or flavoring additives, and is barreled at cask strength. Today’s blends will be slightly different than Bishop’s original blend, but Copper & Kings uses a solera variation by re-blending a portion of original batches into the newest batches. At an event last spring, a Copper & Kings employee told me that this brandy was finished in Oloroso Sherry casks, but I couldn’t get confirmation from Copper & Kings Head Distiller Brandon O’Daniel. Bishop’s original’s Butchertown Reserve was not finished in that manner, and it’s doubtful that the current blend is either. I also learned that while initially Cooper & Kings sourced most of its used Bourbon barrels from Woodford Reserve, now its barrels are sourced from Willett. Copper & Kings and Willett have a similar style, so this relationship makes sense. Silky amber with brilliant gold in the light. Butchertown has robust aromas of caramel, vanilla, and fig, and fruit. The high proof is evident, but not in a distracting way. There is some similarity to a cask-finished Bourbon, but it’s far fruitier than Bourbon, especially with dark berries and the obvious grape. Definitely brandy, but with many Bourbon characteristics that I love imparted by the charred oak. The brandy really pulled the vanilla and caramel flavors from the wood, but it’s still focused on dark fruit flavors along with some lighter pear flavors, and then it transitions to spice. The heat from the high proof is also pretty evident, so I preferred it with a splash of water, which emphasized the grape and dark fruit flavors, and a single cube was my favorite way to enjoy it. Some oaky dryness, but still fruit sweetness and silky through the end, for a warm, medium finish. If Brandy proves to be the “next big thing” (it would have to beat out American Rye Whiskey first), we will all be hearing more about Copper & Kings because it will be leading the way. Introducing Brandy that is reminiscent of whiskey is one way to make headway, and maybe that’s why, while I haven’t been a fan of most brandy that I’ve tried, Butchertown Brandy changed my tune. I highly recommend it; even for those like me, who usually stay laser-focused on Bourbon, it is an excellent diversion.